We now have a message board! It's open for general discussion and topics but please remember this is a child safe website, unacceptable posts will be removed, and repeated abuse will result in the banning of the offender. We have a new addition to the farm! Buddy is a purebred belgian colt, born 2-1-02. He comes with a story, you see, Buddy is an orphan. In the horse industry, there is what's known as "Nurse mare farms". When horse breeders are dealing with high priced, prized horses, they can't afford to lose a foal because it's mother cannot provide enough milk, or if the mare dies from birth complications. To remedy this, they hire nurse mare farms to supply them with a "wet mare" or a mare giving milk. The farms keep a constant supply of wet mares, but the actual foals produced from these mares are a "waste byproduct" and are sent to slaughter houses where the highly prized horse meat is sold overseas, unless they are adopted. Most nurse mare farms do attempt to place the foals in homes, but not all do, and there are so many that need homes....The work of hand feeding foals is labor intensive, time consuming, and there is no guarantee they will survive. An overpopulation of horses in the USA limits the number of homes available, and unfortunately, there is little chance the race horse and show horse industry will change their practices. The Stevens Family Horse Farm have decided to purchase and hand raise one of these orphans because we believe it would be a shame for this foal not to reach it's full potential. Buddy will be coming home to us the week of March 8th. The products sold on our "Horse and People products" page help pay for his formula, grain, vet bills and the costs of his adoption. Another problem is Pregnant Mare Urine (PMU) foals, the medical industry that produces hormonal replacement medication for post-menapause women, use the urine collected from pregnant mares. 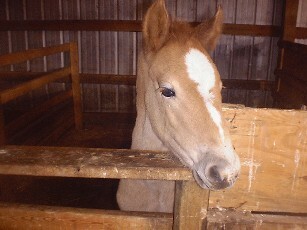 The mares are bred, the urine collected, and when the foals are born, they are sold to slaughter or (if lucky) adopted. When a mare no longer can breed, it too is sent to slaughter if not adopted. The truely sad part of this operation is that there is a synthetic replacement for the drug which would virtually eliminate the need of PMU farms. PMU farms are probably the biggest producer of unwanted foals in the United States and Canada. Finally, the "backyard breeders" contribute to the overpopulation of unwanted foals. Pleasure horse owners, either enthralled with the idea of raising a baby horse, or under the assumption they can produce a quality offspring, often find themselves with more than they can handle. A foal is much like a young child, only much stronger and weighing several hundred pounds. Inquisitive and curious, they often get into mischief the horse owner isn't prepared to handle. The owner may find themselves financially unable to feed and care for more than one or two horses, and the foal becomes a burden. What can you do? If you are on hormone replacement therapy, ask your doctor to be placed on a synthetic (produced from plants) medication. By decreasing the demand for PMU, a decrease in the number of foals will drop, and there will be a better chance of adoption for the rest. Finally, if you truely wish to raise a foal, consider adopting. There are lots of reputable organizations that can provide you with your own foal, some are even registered breeds, without the cost of breeding your horse, or the risk of losing your horse to complications associated with birth. Take a stand, make it right, save a life.